Complete protection against espionage in single kit! 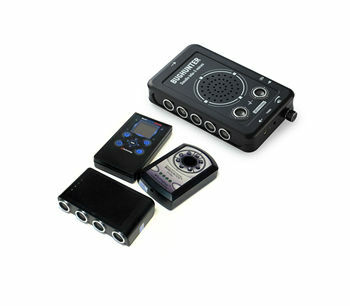 Our most advanced devices for security provision are included in the protection against surveillance and eavesdropping kit: RF field detector "BugHunter Professional BH-03 Expert", hidden camera detector "BugHunter Dvideo" and microphone and dictaphone suppressor "BugHunter DAudio bda-3 Voices" with external US speaker. With their help you can provide complete protection of your personal and business life against interference of competitors and spies. A complex kit against espionage "BugHunter" will help you organize a reliable security system and save money! Devices in the kit may rightfully be called the best among analogs. They belong to the professional category of devices and have corresponding specifications. All devices contain our own unique research an development designed to increase their work effectiveness. That being said even a non-professional can use it after simply reading the manual. By buying this kit, you are getting a significant discount, since the value of these devices is much higher if purchased separately. 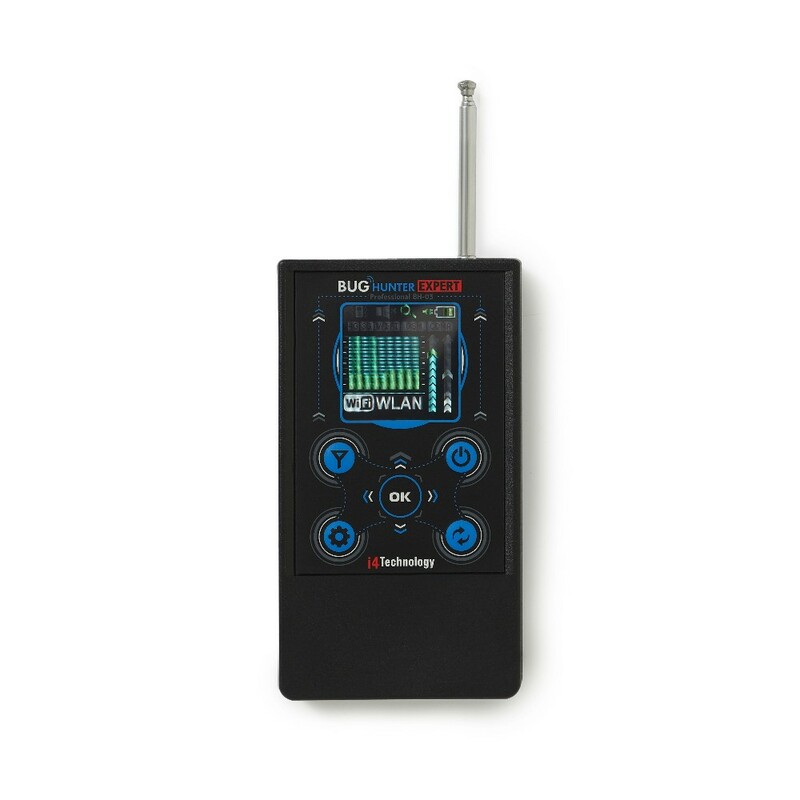 RF field detector "BugHunter Professional BH-03 Expert"
The "Expert" modification is equipped with a built-in frequency meter, allowing to measure the operating frequency of detectable "bugs". It also has an intellectual system of interference filter, which automatically defines which filter should be turned on for more effective search of wireless spyware in a certain room and shows corresponding information on the big informative OLED display. The device operates in a wide range of frequencies from 10 to 3500 MHz and extremely quickly performs SIMULTANEOUS search of digital and analog "bugs", it also stands out with record high dynamic range and sensitivity. 5 operating modes are supported with the ability of fine adjustment. The average time of "bug" detection in a 20 sq.m (215 sq.ft) room — 1 min. 21 sec. Hidden camera detector "BugHunter Dvideo"
Compact professional class device for revealing any camera with open lens (even very well hidden) and located at the distance of up to 5-20 m (16-65 ft). 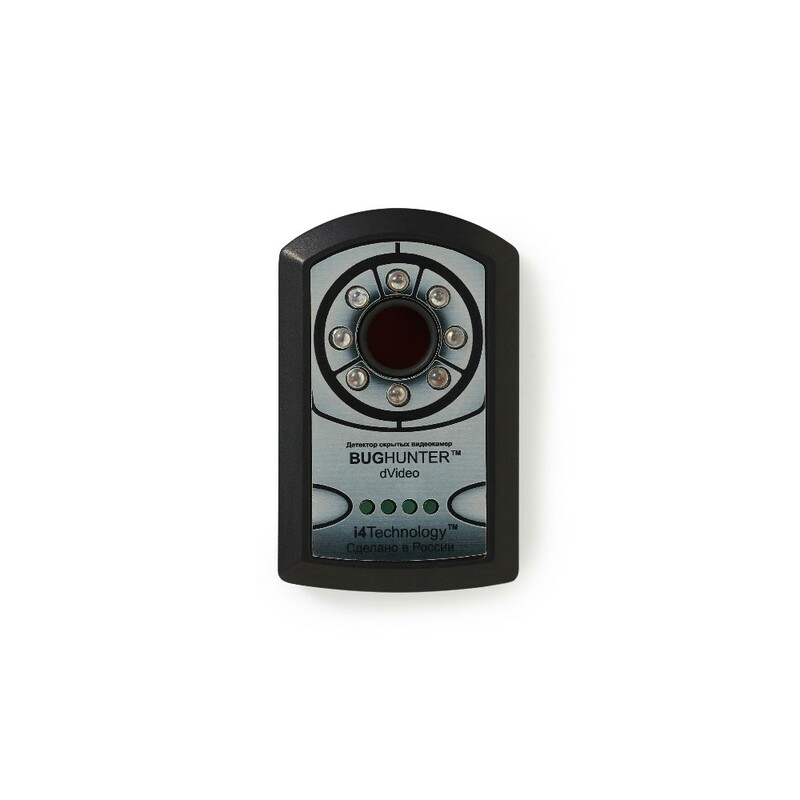 It detects wired and wireless videocameras, including the one that are not active at the moment of search by glare from optical system lenses. It supports 5 operating modes with various frequency of light flashes, which ensure excellent search results at any level of illumination. It utilizes extrabright LEDs (8 red and 4 green) with an increased life time. It is one of the best optic detectors in the world! 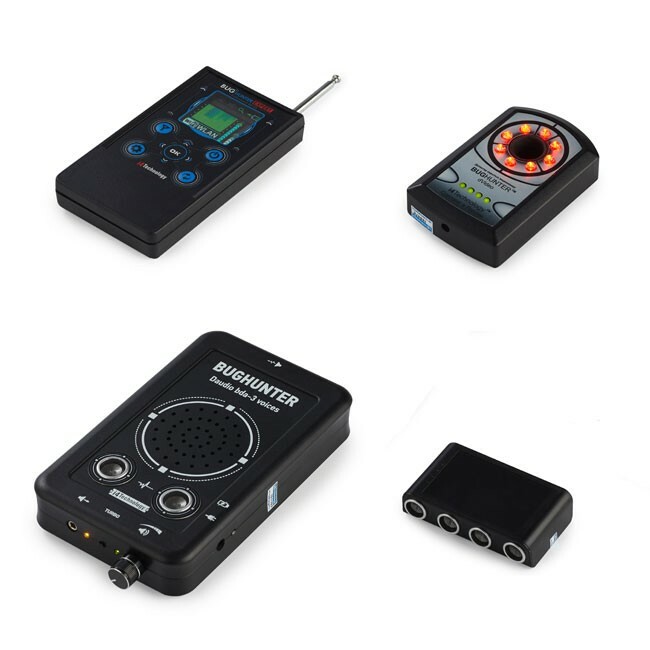 The device suppresses any microphones, dictaphones (including professional ones) and other eavesdropping devices within up to 7 m (23 ft) range. The suppressor is equipped with an improved ultrasonic interference system due to utilizing signature ultrasonic pattern and the capability to connect an additional ultrasonic speaker. It has 5 US-transducers in the side panel and 2 in the top panel directed upwards, which creates a "virtual wall" effect for maximum protection against the audio-recording device directed at the person. For maximum effectiveness of the ultrasonic interference "TURBO" mode should be engaged. In addition to ultrasound there is a powerful speech-like interference, which generates randomly and makes any eavesdropping via sound recording equipment absolutely impossible. The volume adjustment of acoustic interference is built-in (up to its complete deactivation to provide stealthy operation). 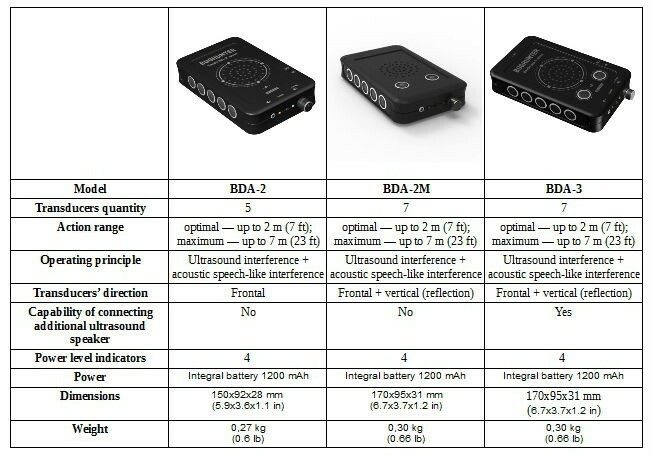 External ultrasonic speaker, supplied with the microphone suppressor, allows to organize a more effective interlocutors security system against recording through locating ultrasound sources from different sides. The speaker is equipped with 4 ultrasonic transducers. The connection is executed via mini-jack 3.5 mm, up to 2 speakers can be engaged simultaneously by using an audio splitter. Bug detector "BugHunter Professional BH-03 Expert"
- Weight: 110 gr (0.24 lb). - Weight: 90 gr (0.2 lb). 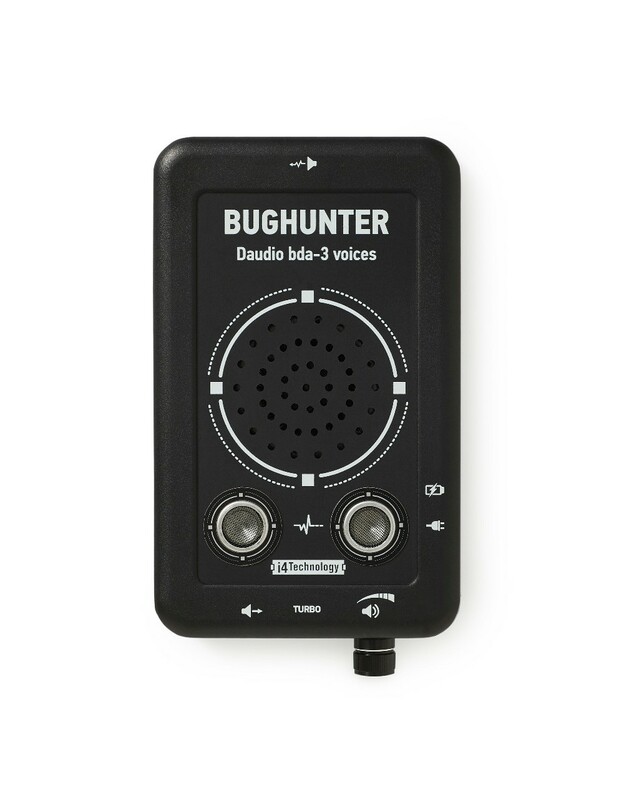 Microphone and dictaphone suppressor "BugHunter DAudio bda-3 Voices"
- Weight (without the adapter): 300 gr (0.66 lb). - Weight (without the adapter): 80 gr (0.l7 lb). - External ultrasound speaker for "BugHunter DAudio bda-3 Voices" (full set).